This Saturday May 11 at 9 AM, Skip plans to move the access dock from French Creek Marina to its final location at the Regional Dock off Frink Park. Given good weather, it will take until about 10 AM to have it on site. Divers in the water will be needed at Frink Park. The two 1000 pound mooring blocks will be picked up by the Village of Clayton DPW and taken from Thousand Island Ready-Mix to Frink Park on Wednesday May 8th. The plan is to have them in the water by Saturday. 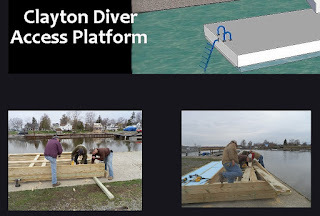 As discussed at the last Clayton Diving Club Meeting, the divers may be needed to move the anchors into their final locations. Please contact Skip Couch if you plan to attend and help.